Jul 06, 2018 Forever Flawless LLC, is the manufacturer of the Forever Flawless line and the brand owner. Forever Flawless LLC does not own or operate physical retail locations. All retail locations worldwide, though they may carry this brand, are privately owned and independently operated. These operations are managed by separate business entities, and while some have negotiated to utilize the Forever Flawless branding for their signage and marketing purposes, they are governed by the mandates and policies of their ownership teams. Forever Flawless LLC, is not directly affiliated with the resellers in any way. That retailer is a private, third-party business, that chooses to sell the Forever Flawless line among other lines and they are supplied with the Forever Flawless brand via a network of wholesale distributors across the country. As such, each retailer may have their own policies regarding pricing, returns, exchanges etc. As you have made your purchases at an authorized Forever Flawless Retail Location if you are seeking a return of your purchase price we must direct you to that reseller's customer service department for further assistance. We do not have access to the finances of the Retail Locations. If you would prefer a direct exchange, here as the distributor we will be glad to provide a replacement product for you. If you could provide your receipt copy plus your mailing information, we will send any replacement product to you as soon as possible. I ultimately was refunded all but $1000. That is still a hit for two rounds of facial irritation, but I want nothing to do with this company. I will never shop at that Park Meadows Mall in Lonetree Colorado. When banks and friends say bring a friend to dispute a company in person, says something. I said all was happily resolved but didn't realize I did not get a full refund on one of my cards and that slight of hand where a credit was applied to the wrong card for kiosk products immediately returned due to burning eyes happened so I lost that money. Talk about paying for nothing. There is heavy manipulation and isolation tactics used by this organization. The fact that the namesake company doesn't feel culpability for franchise behavior is disgusting These are only my opinions. A single customer who means nothing to a money making machine. 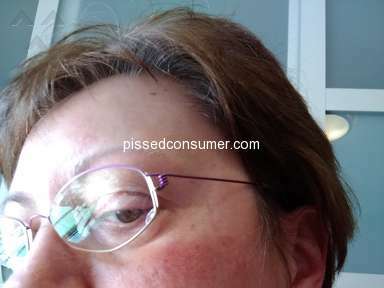 A sick customer who needs her money to personally fund healthcare for a chronic serious set of illnesses. This is evil, masking as caring for well being. A place that doesn't even have to comply with Colorado Dept of Regulatory Affairs. Don't pretend to know more than doctors. Don't tell people they don't need sun screen. Never contact me again forever flawless. You literally made me sicker from the stress you caused me and the discomfort I went through. This is resolved because I don't have the health or energy for lies and theft. This is just my experience- others may do better. I feel tramatized by this company. I complained twice to BBB.First complaint, I got back more than half of my money and a different location, "milder" product line. I gave them benefit of the doubt that this resolution was reasonable This second try resulted in the rash example below. Thus the second BBB complaint. I also contested to credit cards that I used. Overall I had bad reactions to both Diamond and Seacret product lines. The sales person called me yesterday saying I put him in a bad light, and the store. I was told 3 years of products for free, now it is 2 per the phone call yesterday. I don't want anything but my money back. 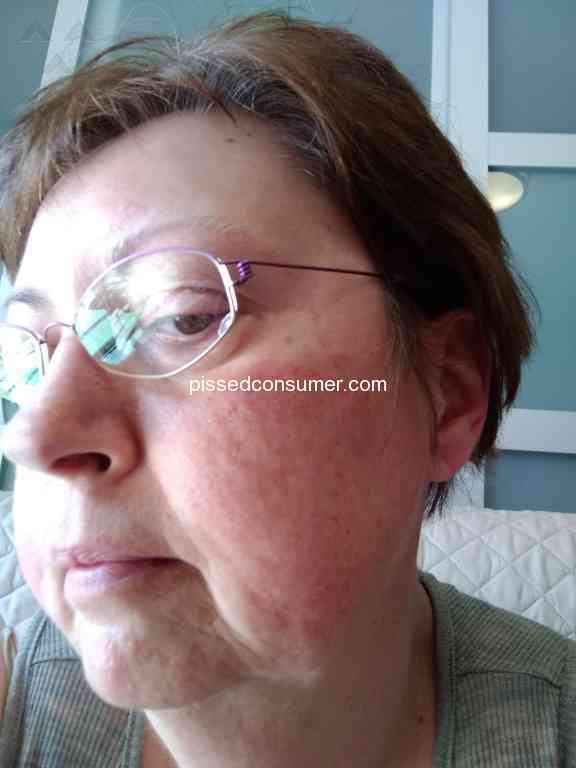 People with lupus, scleroderma and or rosacea beware. They told me don't use sunscreen, it's not necessary, zinc is bad....to a lupus patient! These people are not doctors. I bought sensations of heat in face, itchiness, redness, tearing eyes, more brown spots. When I reported the below I got a call the next day and was offered more facials and to come in and review the product catalog for more products. I was told this is to be expected, having a little redness. No! What if next time I go into anaphalaxis? I want my money back. I emailed the owner and got my salesperson responding. I end up just feeling manipulated and cheated. He earnestly wants to provide an excellent customer experience but doesn't realize excellence would be to acknowledge the failure and let me go and not jeopardize me further. The facials do something that improves deep lines but the daily regimens cause allergic reactions. I do not want other products. I do not want anything but to return what I have and get my money back. The owner never responded to my email.Maybe they needed more time, but my gosh with picture below they should respond right away. I am not accepting intimidation by the salesperson that he is recording my calls and has been No integrity at this store. I have been told, by signing to accept partial refund I can't ask for further refund when the exchanged product caused the below. I don't even have copy of what I signed and thought it was a typical refund form. $10000 loss as it stands as of today. I am in infusion/chemo and this is extremely stressful, aggravating my illness. I don't want to be isolated/taken to the back, having my salesperson touch my hands and trying to negotiate something else like he did last time. A reputable company would accept returns and not do this to the consumer. The attached picture is not just "a little redness". And by posting this my HIPPA rights are violated. But people need to know to be careful and not to buy unquestioning. Homework is needed. Checking with your MD first if you are sick is needed. Review #1292374 is a subjective opinion of HolisticSpinyDogfish.